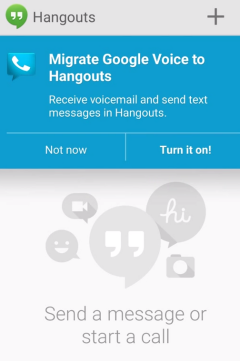 Google already announced that Google Voice's functionality will be added to Hangouts. Here's the interface that will be used for migration when this feature will be publicly released: "Migrate Google Voice to Hangouts. Receive voicemail and send text messages in Hangouts". 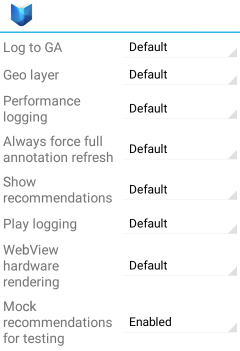 This dialog can actually be displayed in Hangouts, but the underlying functionality can't be enabled for now. There's an Android app called #DebugAllTheThings that enables debugging features from various Google apps like Play Store, Play Music, Play Books and Hangouts. It requires root, most debugging features aren't useful for regular users and some of them can even cause issues. 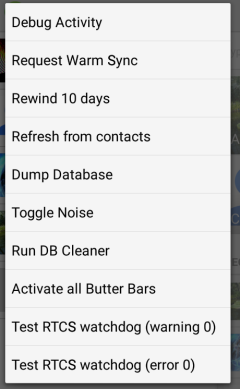 To display this message, install #DebugAllTheThings, enable "Hangouts" in the new app, restart the phone, open Hangouts, tap the menu, select "Debug" (this menu item is added by the #DebugAllTheThings app) and then "activate all butter bars". 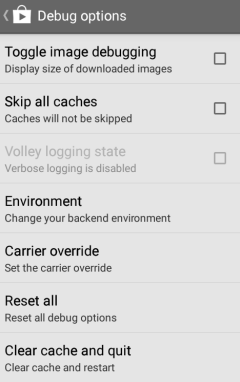 - Play Store: carrier override (not functional), skip caches, export library and asset store databases, disable personalization (this crashed the app for me), dump library state, fake item rater.